Thanks for reading part one about these intriguing 19th century evangelists whose innovative techniques of preaching and singing the gospel influenced many generations for Christ, even into the 21st century. In Part 2 we pick up on the music man of the duo first and later join with D. L. Moody, the team leader. Thanks again for reading this research effort. It is an honor and joy to present it to you here. At first the duo worked together among Moody’s Chicago congregation in early 1871. They visited the poor, prayed with the sick, and conducted daily noon-time prayer meetings. ‘To-day the Saviour calls.’ By the time I had reached the third verse, ‘To-day the Saviour calls: For refuge fly; The storm of justice falls, And death is nigh,’ my voice was drowned by the loud noise of the fire engines rushing past the hall and the tolling of bells, among which we could hear, ever and anon, the deep, sullen tones of the great city bell, in the steeple of the old court-house close at hand, ringing out a general alarm. The start of the great Chicago Fire had produced a ruckus in the streets and the congregation grew restless. Moody promptly closed the meeting, out of which he and Sankey rushed away separately to assure the safety of the congregation and to care for their own families. The duo would not meet again for more than two months. They would eventually take a trip to Britain where everything seemed to change in size and scope of ministry for the evangelists. 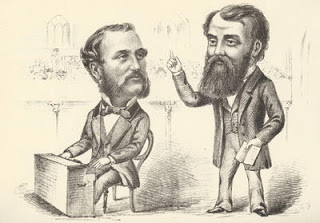 After their trip to Britain, the pair’s first large campaign in America began on October 31, 1875 in Brooklyn, with a choir of 250 voices, accompanied by a large organ. In Philadelphia, the choir numbered 500 people. The New York crusade accommodated a choir of 600 voices led by Sankey, and the audience became the duo’s largest to date. Cities across America, Canada and Mexico invited the team to minister. They traveled back to the British Isles between 1881-84, where they discovered many dedicated Christ-followers from the preceding crusades. At Chattanooga the colored people boycotted our meetings, the colored ministers taking offense because they were not invited to take seats on the platform. We arranged a special meeting for the colored people, and were surprised to ﬁnd the church nearly empty when we arrived. But Moody was not to be defeated in this way. He went out into the street and gave personal invitation to hundreds of colored people, and no further difﬁculty was experienced. Moody, ever aware of the plight of the poor, was convinced that salvation would lead to cleaner and better living in the inner cities of places like Chicago, although he did not always address the social implications that led to the slum conditions. Nevertheless, his impassioned preaching style was often emulated, and the revival became a fixture in the American urban setting. Publicity was an important component of the Moody crusades. One aspect that distinguished Moody from his predecessor, evangelist Charles Finney, was Moody’s ability to permeate both the religious and secular press; Finney rarely received attention from secular newspapers of his day.Throughout his career, Moody utilized the press to his advantage. Although the New York Times scathed the duo while in Britain on their first campaign—calling them vulgar, course and ignorant fanatics—the sentiment reversed upon their return to America. The timing of their arrival coincided with a domestic financial crisis and an onslaught of secularism, to which their Christian message offered a welcomed prescription of needed hopefulness and assurance. Music was an essential part of the Moody/ Sankey crusades. Even though Moody himself was tone-deaf, his son William remembered his father’s belief that singing had a “great and at times overpowering religious value.” Moody felt that before the evangelist arose, people were oftentimes already moved and persuaded—that many decisions for Christ were actually made during the singing.The music portion of a typical meeting would begin with a solid half-hour of congregational singing, intermingled with Sankey’s own free-flowing, somewhere-between-singing-and-speaking vocal style, in order to maintain a focus for the congregation—to keep their minds from wandering. An innovative concept of the Moody/ Sankey evangelistic presentations originated from the philosophy that to improve the quality of a meeting was to make it interesting.This included arranging the music, preaching, Scripture readings, solos, etc., in a thoroughly appealing and disarming manor.As another technique to make the services interesting, the duo was also at the forefront of approving the visibility of musical instruments in the services, as opposed to placing them out of sight. There is a caricature of Sankey in the Ira D. Sankey Collection at The Lawrence County (New Castle, PA) Historical Society, which shows the song leader playing his portable cabinet organ at the front of the platform during a crusade. James Findlay wrote in a Moody biography that the “taproot of the evangelical experience and practice…is found in the conversion of the individual sinner.”This reality prompted Moody to focus on providing several innovations in order to effectively reach the single sinner within the multitude. This included making use of neutral public spaces rather than church buildings in which to hold meetings, constructing special areas called “inquiry rooms” within the venues where the penitent could be facilitated. He also instituted house-to-house canvassing of residents prior to crusades and recruited charitable funding by the business community.These efforts facilitated large crowds to allow the duo to deliver an engaging presentation, leading thousands to Christ over the years. No work was so important as to make him neglect his family duties and privileges. He took keen interest in the experiences of his sons at school and college, and shared their joys and entered into the excitement of their sports with the zest of a fellow-student. The slightest matter that caused sorrow or pain to any member of his family, even the youngest, engaged at once his personal concern, and no drudgery of house or farm was beneath his notice or sympathetic interest. He had learned the secret of being a confidant of all, sharing others’ burdens, weeping with the sorrowing and rejoicing with those glad of heart. Together Moody and Sankey would develop innovative evangelistic techniques, including aggressive salesmanship, using the press to advertise the meetings, and utilizing the power of song to bring about great successes in the campaigns. They also harnessed support for their projects through Christian businessmen; they many times preferred large buildings with increased functionality to church buildings in which to hold meetings. They understood the potent significance of reaching young people, and opened an “inquiry room” in the venues for those who wanted to repent. Taking into consideration all of the evangelistic innovations that were developed in the 19th century, which were utilized throughout the 20thcentury from Billy Sunday to Billy Graham, evangelical Christians the 21stcentury owe much to the “dynamic duo.” Moody and Sankey’s pioneer spirit prompted the increase of advanced techniques to reach people around the world with the love of Jesus Christ. Ira David Sankey, Sankey’s Story of the Gospel Hymns and of Sacred Songs and Solos (London: The Sunday School Times Company, 1906), 3. “Moody and Sankey’s Dates,” The New York Times, January 25, 1886. Ira Sankey, Sankey’s Story of the Gospel Hymns, 80. William G. McLoughlin, Modern Revivalism: Charles Grandison Finney to Billy Graham (Eugene, OR: Wipf and Stock Publishers, 2004), 219. The New York Times, July 5, 1875, p. 1. James F. Findlay, Dwight L. Moody: American Evangelist, 1837-1899 (Eugene, OR: Wipf & Stock Publishers, 2007), 207. Caricature of Sankey in the Ira D. Sankey Collection at The Lawrence County Historical Society, http://www.lawrencechs.com/museum/collections/ira-d-sankey-collection/ (accessed November 18, 2016). John S. Curwen, Studies in Worship Muisc, Second Series (London: J. Curwen & Sons, 1885), 40. Dr. David Maas, “The Life and Times of D. L. Moody,” Christian History Institute, Issue 25, 1990, https://www.christianhistoryinstitute.org/magazine/article/life-and-times-of-moody/ (accessed November 18, 2016).